The waterfront of St Tropez is lined with stalls of art by local French artists of the Provence. Local artists sell their wares along Quai Suffren in the tourist resort town of St Tropez in the Provence-Alpes-Cote d'Azur, France. The atmosphere of this bustling little town is lively and truly Mediterranean! Paintings by local artists along Quai Suffren in St Tropez, The Var, Provence, France, Europe. 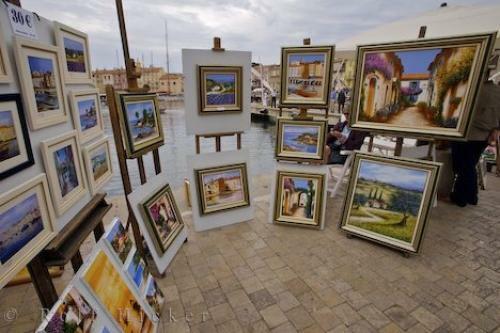 Photo of works of art by a French artist on sale along the waterfront of St Tropez, Provence, France.